Irv Gordon has driven his red Volvo P1800 over 3 million miles since new. Read more about why he drives his Volvo. 2018 Memberships start September 1. Are you up-to-date? Read this year's message from Tony Giverin; news for this year. Come out to see our largest event, lots of old and new Volvos. Articles for the CVC newsletter (owner & car stories, Volvo news, technical info) and a classifieds section specific to Volvos- In your inbox every season. The CVC Annual “Family Day” was held this past July 29 th, making it the 38 th annual event for the club -- the last 21yrs hosted by Bev & Beverly Hughes! The day started under sunny skies with late afternoon showers, just in time for everyone to gather in the awards shed for closing ceremonies. At last count we had 90 Volvo’s and their families registered. 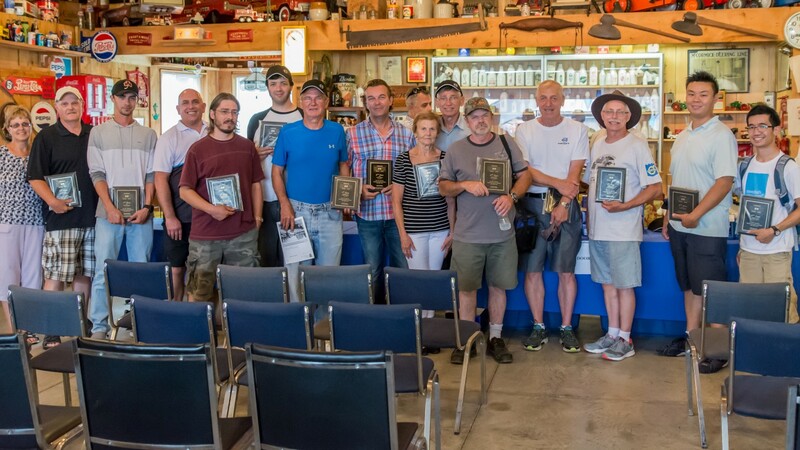 Volvo owners from south of the border and all points of Ontario gathered, including representatives from both Volvo of Waterloo and Volvo Metro West. The generous donation of swag from many Volvo dealerships, Volvo aftermarket specialists, and Volvo Car Canada were given away as door prizes throughout the day, and everyone went home with something! Volvo door prizes were generously donated by John Martins (Proprietor), Kyle Fedsin, Andrew Murdoc, Hamilton Volvo &amp; Volvo of Oakville; Lorenzo D’Alessandro (Proprietor), Gary Sodoski, Volvo Metro West; Marcel Algieri (President), Chris Chapman, Newmarket Volvo; Scott Weller, Dan Wightman, Ken Ma, Volvo of Waterloo; Robert McMillan (Retailer Principal), Mark Garrett, Jim Piper, Mirza Mustapha and Alex Caron, Volvo of Mississauga. Additional prizes came from Dan Reynolds, DRD Distributing; Tim Hortons Woodstock West, and Sherri Hicks, Workshop Hero. We should also acknowledge the donation of numerous items for this year’s flea market from Don Leonard before he passed away and additional items from his wife Mary. Don and Mary have always thought of ways to support the club. The CVC Executive would also like to acknowledge Mark McCullough, MMC Productions for providing the sound system, Fred Sleight, Engineer and Conductor, for providing free rides on the Volvo Train, and the Bryanston-Birr Optimist Club for providing the yummy food truck. We would also like to extend our gratitude to the dedicated crew of volunteers who help with preparation of the grounds before and after the show. Their help makes the show happen! A special Thank You to Volvo Car Canada, specifically Alexander Lvovich, Managing Director of Volvo Car of Canada, for partnering with our People’s Choice Awards, providing the beautiful award plaques in addition to Volvo swag given away at the gate. On behalf of the CVC Executive, a warm and appreciative Thank You! to everyone who helped to make our annual event a success once again! The Canadian Volvo Club is a non-profit automobile club which encourages enthusiasm for Volvos. The CVC is dedicated to the promotion of safe, fun events and activities for all its members and the Volvo community. The Canadian Volvo Club is an unaffiliated non-profit organization made up of Volvo car enthusiasts. The Club's goal is to promote enthusiasm for Volvo cars. Our newsletter and events allow our members to network with other Volvo owners in a mutually supportive way. All Volvo models are welcome and citizens from all countries can join our club. We have added a new membership benefits description page: visit our membership pages.